Mon Valley YMCA | The NEW Mon Valley YMCA App is Here! 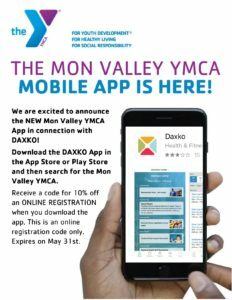 We are excited to announce the NEW Mon Valley YMCA App in connection with DAXKO! Download the DAXKO App in the App Store or Play Store and then search for the Mon Valley YMCA. Through the app you can upload your member scan card, view class schedules, set reminders for classes, register for classes and events and receive important announcements and promotions. As a thank you for downloading the app, you will receive a code for 10% off an ONLINE REGISTRATION for one program. This is an online registration code only and cannot be redeemed when registering in the Business Office or over the phone. The code will expire on May 31st.